Today: Yotam Ottolenghi and Sami Tamimi, authors of Ottolenghi: The Cookbook, share their thoughts on Israeli cooking, food inspirations, and their favorite ways to cook at home. We're also giving away five copies of their book! Yotam Ottolenghi and Sami Tamimi are quite the team. Together they founded London's most popular take-away deli, Ottolenghi; opened a fine dining restaurant; and coauthored three cookbooks that have won them a loyal following. Earlier this month, they released their first book, Ottolenghi: The Cookbook in the US, which was first written in 2008 in response to customer demand for the recipes behind their shops' most-loved dishes. With behind-the-scenes snapshots of the restaurant, patrons, and team scattered among sumptuous photographs of food, Ottolenghi: The Cookbook introduces us to the cooking style that began what is now an empire. Read on as we talk to Yotam about the present and future of their cooking -- and enter to win a copy of the book below! Israeli chefs, Jewish and Palestinian alike, are opening up more and more restaurants across the US. What do you think is pushing this influx forward? Might there be an Ottolenghi/Tamimi American outpost one of these days? We’re both huge fans of America: Sami’s just back from his holiday in New York having had what he described as one of the best meals of his life at The NoMad. For a man not inclined towards hyperbole, this is a pretty stunning compliment! Setting up shop outside London is a constant conversation, but there are no plans to do so for now. Our team is a pretty close-knit family and we love our day-to-day contact and visits between the delis, restaurants, and test kitchen, checking in on everything and chatting with staff and customers. Like slightly over-protective parents, we know the family will spread its wings at some point, but for now it feels right for everything to be at arm’s length and under our close watch. Who knows that the future will bring, though. Some of my happiest memories are in America -– a formative few months in San Francisco as a kid, a recent period spent in Boston –- and I’ve no doubt there will be many more. There has been a lot of talk over the past few years about "New Israeli cuisine." What does that mean to you? Sometimes there is confusion between Palestinian food and new Israeli food because Israelis have incorporated many of the mainstays of Palestine into their diets. There is, however, a deepening sense of new food that is unique to Israel and is championed by both home cooks and chefs. This cuisine takes Palestinian elements (aubergine, hummus, tahini, garlic, and many particular cooking techniques) and homely Jewish Sephardic elements, plus (to a much lesser degree) a few Ashkenazi influences and other general European trends -- and amalgamates everything into a culinary style that is becoming more recognized in the US and the UK. I heard about the Zucker Bakery’s Kubbeh Project and Michael Solomonov at Momofuku Ss?m Bar which both sounded great. I’m also intrigued to try the tomatillo-sauced ‘green shakshuka’ at Jack’s Wife Freda the next time I'm in New York. 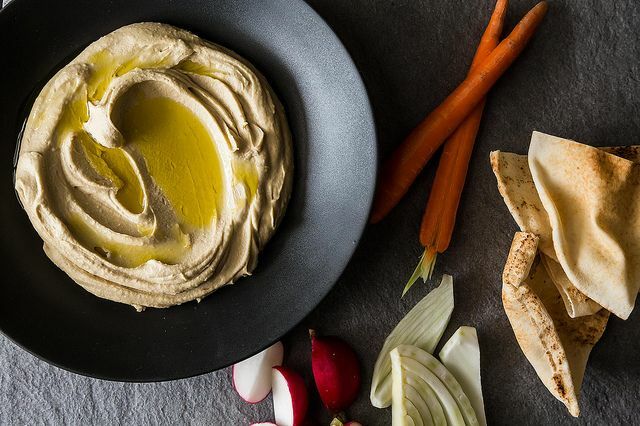 More: We know Israeli food is more than hummus, but this Genius recipe will always be a favorite. What types of cooking inspire you these days? So much, all of the time! I’m just back from a summer of travelling, cooking, and filming around the islands of Corsica, Crete, Sardinia and Mallorca so there’s a huge amount to draw upon from this. Some highlights which I’m keen to get experimenting with: pulenda, the chestnut polenta I had in Corsica; the sweet Mallorcan ensaïmada pastries; Crete’s savoury bougatsa pastries; a stunning fava purée I had in Crete called Koukia, with capers and onions. An idea here, a taste there: it all gets filed somewhere in the brain for future testing. I’m also crazy right now for any cooking which makes use of fermented ingredients -- like kimchi, brown miso, and the fermented yogurt kashk. What do you each cook when you have a day off? Or do you bring home leftovers? For me, there are often leftovers from a day spent in the test kitchen but, to be honest, it’s often take-away sushi or noodles or some simple pasta at home. Sami is a fantastically eager home cook and cooks properly on most nights. Beyond olive oil, salt, and pepper, what are the five ingredients that you always have stocked in refrigerator or pantry? Lemons, garlic, red wine, dark chocolate, and a can of smoked oysters. We're giving away five copies of Yotam Ottolenghi and Sami Tamimi's cookbook, Ottolenghi: The Cookbook! To enter, tell us in the comments: what are your favorite Israeli and/or Palestinian recipes? We'll pick winners at random by Friday, September 20th at 3 PM EST. Photo of Yotam and Sami by Geoff Pugh. Cover photo by Jonathan Lovekin. Hummus photo by James Ransom. Food writer, recipe developer, photographer. Some people call me Zahavah, most call me Gayle. I love all of Yotam's work. He is a true artist. The chummus recipe is the best I have ever tasted, the eggplant with Israeli cous cous, the salad with chickpeas, wild rice, and shallots, are downright magical and a flavor experience that sparkle in my mouth. And why is the new cookbook called Ottolenghi when its the work of both? I find this wierd and will not buy it for that reason. My goodness. The recipes are all based on Palestinian dishes. If there is a fusion, fine , but stop calling them Israeli. Did you announce the cookbook winners somewhere? Shakshouka is one of my all-time favorites, but I'm also a sucker for a good tabouleh or a jachnun. Savory favorites: carrot salad, shakshouka, and anything with eggplant. Sweet favorites: honey apple cake and sufganiyot. I love mujaddara and carrot salads. Pretty much anything with cumin and Middle Eastern spices. So fun to read through everyone's comments. I love homemade falafel, hummus, anything made with charred eggplant, and mujaddara, but if I could only pick one dish it would have to be homemade, fresh from the oven challah bread! Moroccan spiced chicken served with Israeli couscous. I grew up in a city with a large Armenian population, so I initially though hummus, baba ganoush, and dolma were solely Armenian. Traveling around the Middle East and eastern Mediterranean area has taught me otherwise, and I love finding how each country alters the dish. I think dolma's are still my favorite, and so far I've enjoyed the Armenian, Turkish, Greek, and Israeli versions. Anything with eggplants! Salat ?atzilim is a fave of mine. I love the eggplant with yogurt dish at Nopi. If I can't make it to london, I live on hummus and baba ghanouj. With my abundance of eggplant, I've been doing many charred eggplant dips. Love the recipe from Jerusalem! I don't know if its Israeli or Palestinian, but I have made their soba with mango and eggplant a million times and love it! Before Sami Tamimi and Yotam Ottoleghi's 'Jerusalem', I had honestly never cooked any Palestinian/Israeli dishes. Now I am basically hooked, thus making it very difficult to choose favourite dishes. Early favourites (I feel like I need to do much more cooking of Palestinian and Israeli dishes to truly decide on a favourite) are Shakshuka, Kofta and Hummus which are recipes I keep coming back to and which have established themselves as staple dishes in our household because they are so delicious.